Jason Freeny needs no introductions right, ha? But what does need an introduction is his take on the MIGHTY REPTAR from the 90’s TV show Rugrats (millennials you might have to youtube it, its worth it) Anyway, FYE have landed an exclusive Jason Freeny stylised XXRAY version of Reptar which will be up for grabs at SDCC 2018 via FYE booth. Don’t worry kids, no blood involved. Thank you XXRAY for taking us down memory lane… Cue the Rugrats theme song, please. See the progression of this limited edition collectable piece starting from drawing to prototype to the finished product. You will receive the finished piece only but we wanted you to see just how this great piece came to life! The icing on the cake is They’ve just gone onto pre-order this week on fye.com. Price: $129.99 USD. This item is available for pre-order and will be sent out in Aug 2018. These will ALSO be available at SDCC too, regardless of the online pre-order. 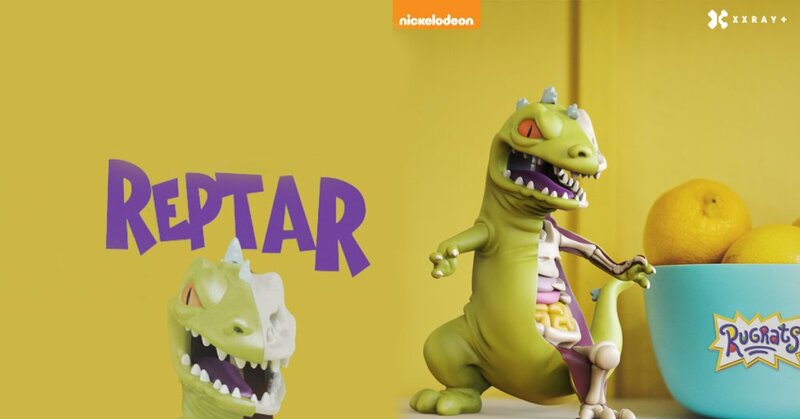 If you are attending SDCC you’ll be able to get your hands on Reptar a month before those that order online.